I like puzzles, especially the find-a-word types. Being trained in college to think in an organized fashion (blame it on computer logic), I always search for words from left to right, then top to bottom. Then, I go back and find any missing words left. Last week, Aileen and I had the opportunity to visit Kopiroti at Tomas Morato branch. Their branch was currently being renovated then so it was kinda cramped. However, the free postcards they offered near the door compensated for the slight inconvenience. Plus, I'd go through any inconvenience anytime for a Kopiroti Kopibun. So after we ordered our food and found a table, we checked out the postcard stand which all Kopiroti branches have. 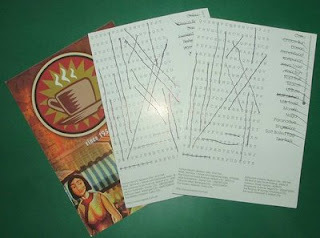 I was delighted to find a Kopiroti postcard which had a find-the-word puzzle at the back. I took three so I could bring home the other two and have my mom and dad try the puzzle. However, I was shocked when all three of them were already answered. They all had pen marks of crossed words and the actual words highlighted (or more of a strikethrough in computer terms). I was surprised that someone would have the audacity to put it back after answering it. It's not like a newspaper in a store that's for public use. Everybody who reads it can equally benefit from reading. A puzzle though, whether it be a crossword puzzle, a find-a-word, spot the difference or maze has zero value to others when answered (not to mention that all the answers are there and nothing else to do). At least those paper placemats by some restaurants like Shakeys, McDonalds or Jollibee always serve a fresh, unanswered activity page in the form of your placemat.